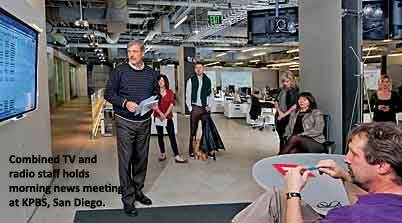 Local NPR – Page 2 – Research about change in U.S. public radio newsrooms. Looks like we have a ways to go in local public radio and television. 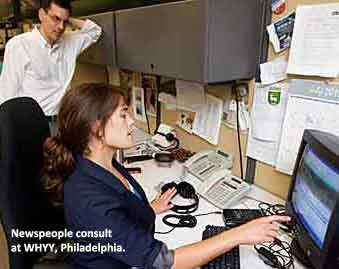 Like the rest of the media, women are underrepresented in our newsrooms. Thanks to detailed reports filed by public stations… we can begin to examine the composition of local public broadcasting newsrooms. The theory is simple: women make up 51% of the population, so their presence in media should be comparable. Where it isn’t (and it isn’t), discrimination may be in play. While the WMC study includes a section on U.S. radio and television, it lumps public broadcasters together with commercial. Moreover, the data used is from an annual survey by Hofstra University’s Bob Papper. Frankly, the survey sample is dominated by commercial stations, so we can’t see with high certainty the state of female employment in public media. All the data here are from 2011, the most recent available. As you can see, right off the bat, when you lump all 3000 news employees from all local stations together (and these numbers do represent over 90% of the actual local public radio and TV workforce), there’s a basic disparity. It gets more interesting when we break out the two main sectors of public media — radio and TV. Radio is the bigger employer of journalists, by a 2-to-1 margin. This is understandable because there are many more radio stations than TV stations. But, perhaps more importantly, local public radio provides the base of the NPR News distribution pyramid; those stations are growing their local journalism ranks. The employment ratio between men and women is better than local public media as a whole. Of course, that must mean that public TV is the bigger culprit in the gender disparity. Whoa! This is comparable to what the Women’s Media Center found in commercial television. In fact, it’s worse. Women’s share of the commercial television news workforce is closer to 40%. One area where the Women’s Media Center was particularly critical of U.S. media was for the dearth of women in executive roles. In general, those percentages show even greater disparity. Looking at the data from public radio and TV, we can count those women who hold news leadership roles (news director, executive producer, senior editor, senior producer, managing editor, etc.). We’ll look at radio news first. You can see that women outnumber men in some of the newsroom leadership roles, but not in the all-important news director (ND) category. Let’s look at the same charts for local public TV. Only one category shows women holding a numerical advantage — Senior Editor — but there are only 7 in the whole country. And the advantage is only by one. Finally, there’s the question of women being seen and heard in prominent on-air positions at the local NPR or PBS station. 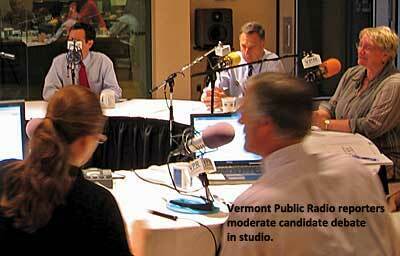 Again, the WMC study didn’t look at public media, but it found that talk radio hosts were overwhelmingly male. And in newspapers, male bylines outnumbered female bylines, 3-1. Another pass of our local public media data extracts the ratio of women to men in such on-air presenter roles as host and anchor. Still, a pretty big disparity. Again, we wonder if public radio with its larger workforce is doing better in gender apportionment than the smaller staffs in public TV. As one can see, public radio stations are favoring male air hosts over women hosts nearly 2-1. Somehow, one would expect public media newsrooms to be doing much better than their commercial counterparts. Afterall, they’re tethered to universities and non-profits with more accountability requirements than the private sector. They tend to be bastions of educated, progressive thinkers. And there’s no mistaking years of systemwide efforts at creating a more diverse, women-friendly workforce. So, while they ARE doing better than their commercial counterparts, public media stations still have work to do if their male-female journalist balance is to mirror the larger society. A survey of U.S. public radio stations shows modest levels of editorial partnering with outside organizations. 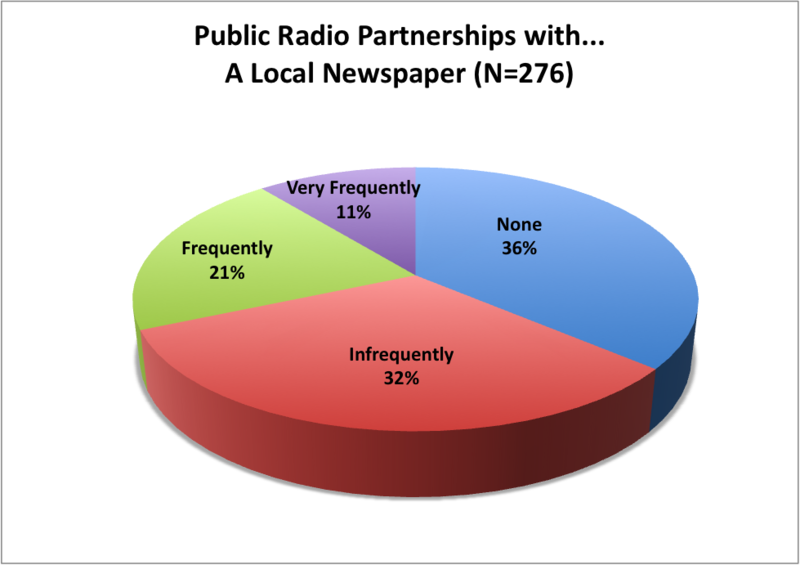 A notable finding is the prominence of partnerships between local stations and local newspapers (30%). 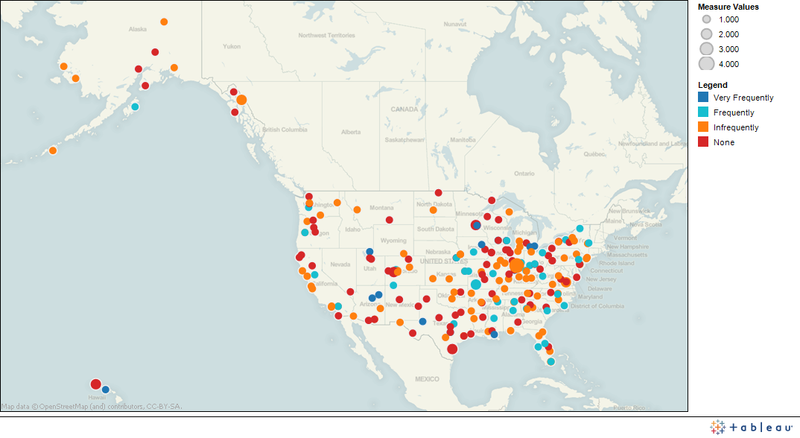 The data also reveal the involvement of stations with non-profit news organizations (22%) such as ProPublica. 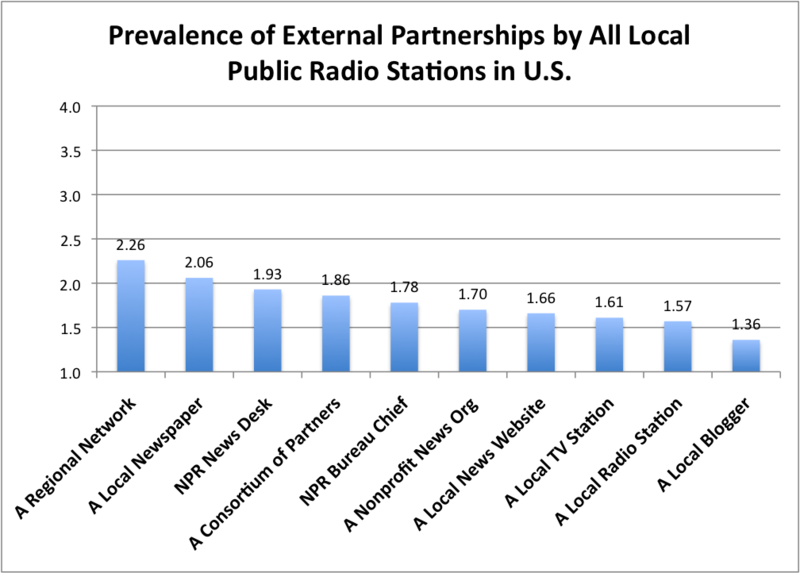 Not surprisingly, the most common news partnerships were between a station and a regional network (40%). Also found were partnerships with local websites (18%), local radio stations (16%) and local TV stations (14%). The least common partnership type was that between a station and a local blogger (7%). How frequently does your local news and public affairs commitment involve sharing with an outside entity you could call a “partner”? The partnerships with NPR were reported earlier here. Below are the individual charts for the remaining eight partnership types, presented in order from most frequent to least frequent. 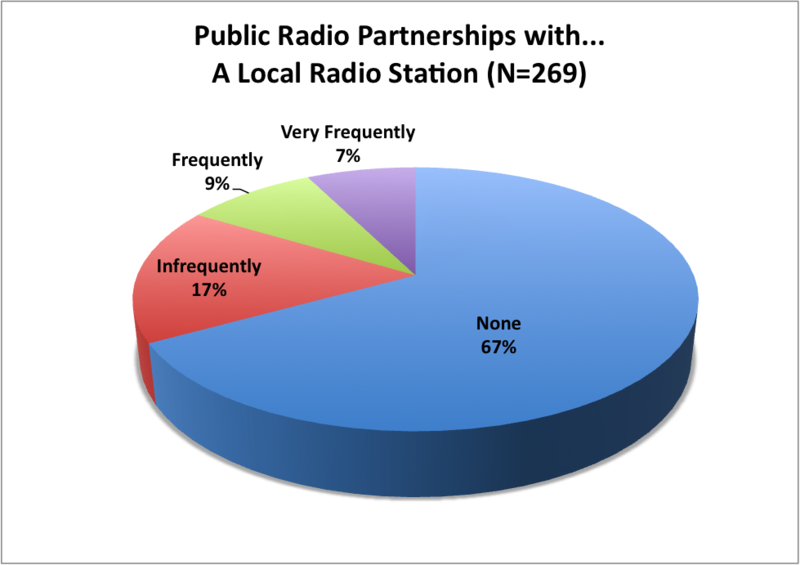 Regional radio networks are quite common and have been round a long time, so it is not surprising to see them as the most frequent form of partnering. Regional networks can take many forms. Some are loose networks for story swaps. Some are hub and spoke models in which a central operator provides content out to multiple stations (e.g., The California Report). Some are variations on the news cooperative idea in which stations co-create stories for common usage (e.g., The Northwest News Network). 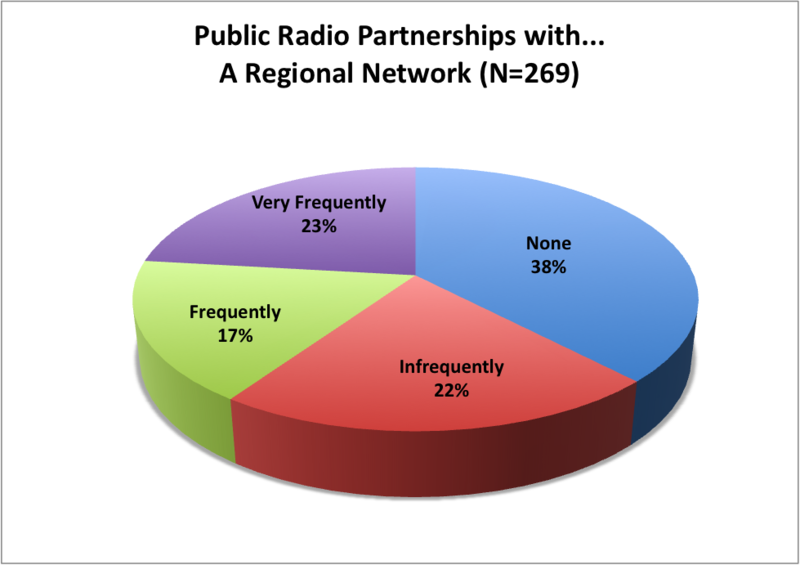 The chart below shows 40% of public radio stations partner with regional networks “frequently” or “very frequently.” Another 22% partner with regional networks on an “infrequent” basis. The survey does not reveal the exact nature of these partnerships, but these are known to range from collaborative reporting projects, to featuring newspaper reporters on the air, to content-sharing arrangements. Newspapers, who have suffered steep losses in advertising, and thus staffing, have been pushing new forms of collaboration — which makes this form of partnering a fairly rich opportunity for both parties. Note that when you consider another 32% of stations are partnering on an “infrequent” basis, you are left with the lowest “None” percentage of any of the partnership types (36%). Partnerships built upon a consortium of stations may also take many forms. One of the emerging models in 2010 was the “Local Journalism Centers” sponsored by the Corporation for Public Broadcasting. These “LJC’s” consist of 3 to 5 stations working in collaboration to concentrate multi-platform reporting on a specialty topic of regional interest. The chart below shows the consortium model to be used “frequently” or “very frequently” by 26% of U.S. public radio stations. Public radio stations are non-profit news organizations and thus may readily align with the mission of other non-profit news organizations — especially if those organizations are able to provide specialty coverage or investigative coverage to augment local coverage. Examples of non-profit news organizations include ProPublica, and the members of the Investigative News Network. Working with a local news website would seem to be an emerging form of partnering. An example might be the way KPBS in San Diego draws upon the coverage by Voice of San Diego (and vice-versa). 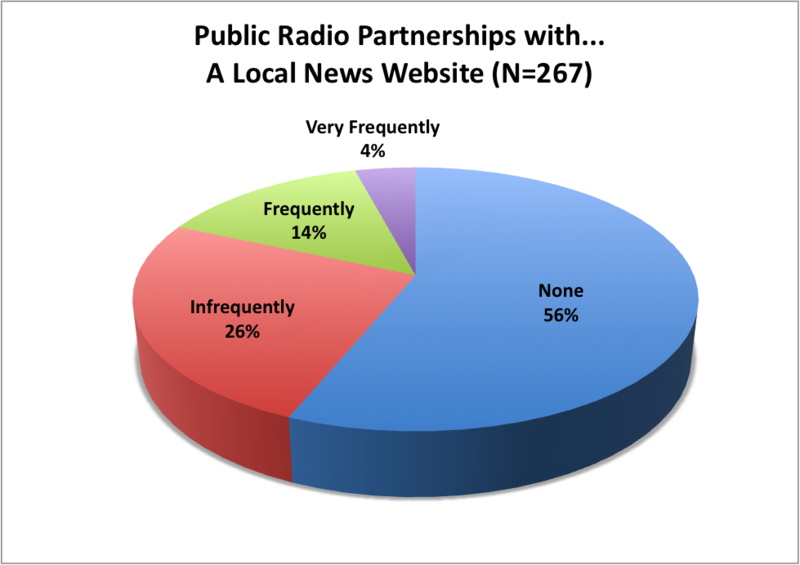 Partnering with a local news website is more common than working with a local broadcaster but less common than working with a local newspaper. Still, 82% of stations have infrequent or no relationship at all with news websites. 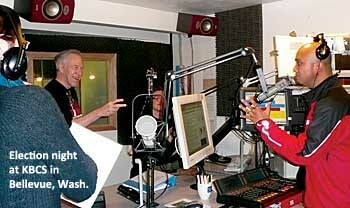 Working in tandem with another radio station is not very common. (FYI — The other station’s status as commercial or non-commercial was not specified.) Some 16% of public radio stations were found to partner “frequently” or “very frequently” with other radio stations. Only 14% of public radio stations say they strike up frequent partnerships with local TV stations. Over a fourth have infrequent relationships with local TV. 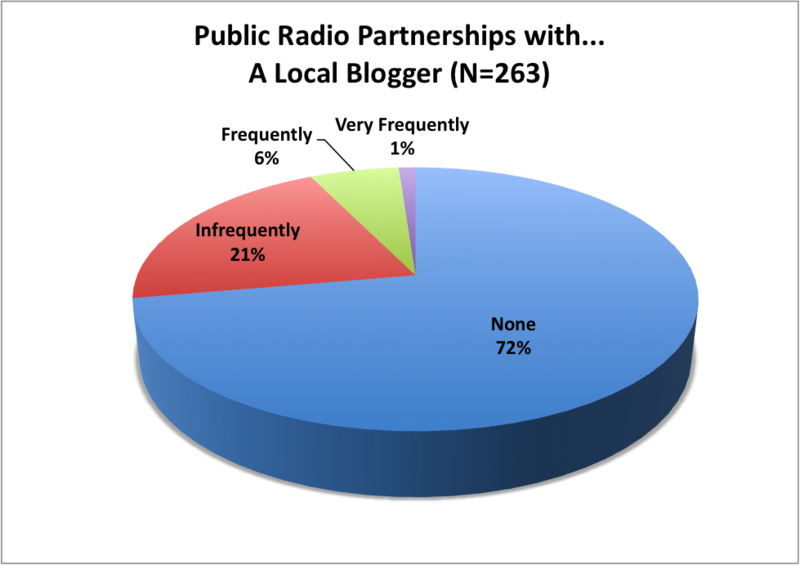 Local bloggers are the least common partnership type among local public radio news providers in the United States. The “None” percentage of 72% is the highest of all the partnership types measured. Earlier we reported that it is generally rare for local public radio stations to be involved with NPR as a news producing partner. The exceptions tend to be the “highly resourced” newsrooms — especially when it comes to partnering with NPR Regional Bureau Chiefs on feature reports. 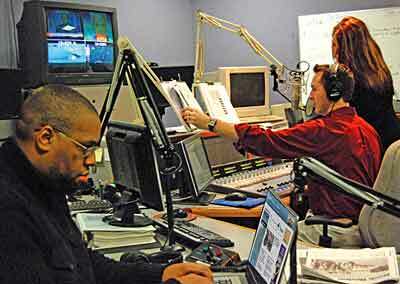 Many more stations found partnering opportunities with NPR when it came to filing spot news reports with the News Desk in Washington DC. The following maps show how this phenomena is distributed geographically.